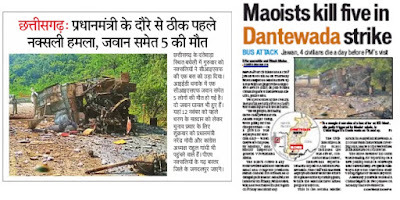 Maoists continue to target security personnel in Chhattisgarh. In the latest incident, they have blown up a bus carrying CISF personnel in southern part of the state. Five personnel were killed in this IED blast. They included four civilians and a CISF jawan. Several other personnel were injured in the terror attack. The incident occurred at Bacheli, which is located in Dantewada district. The bus was badly damaged in the attack. 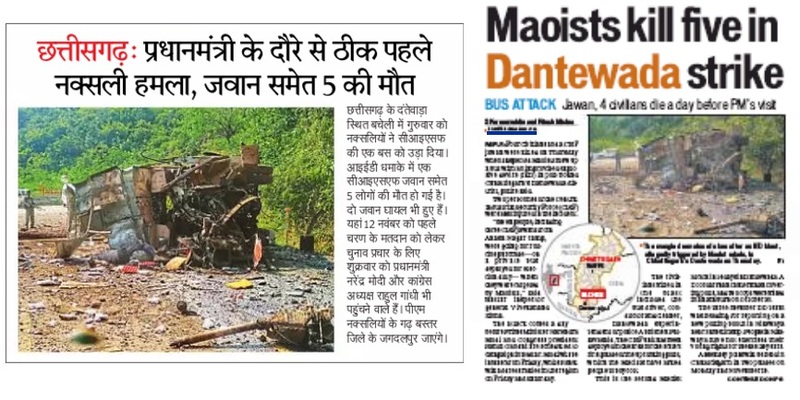 "In all, seven people including three CISF jawans from Akash Nagar camp were going for routine purchase on a private bus deployed for election duty, when they were targeted by Maoists", said a Hindustan Times report, quoting Bastar IG Vivekananda Sinha. Those killed included the driver of the bus and two other on the staff-driver and cleaner. This is the second such attack in ten days in Dantewada. Earlier, a Doordarshan cameraman covering the polls and two policemen were killed on October 30. The DD team was going to Nilawaya near Sumeli camp to report on a new polling booth. There was outrage all over the country after the incident. A video of one of the DD staffer had gone viral. The Naxalites' audacity is all the more surprising as barely a few days from now, high-profile politicians are set to visit the region. PM Narendra Modi is arriving here for campaigning ahead of the Assembly polls. Also, Congress president Rahul Gandhi would also reach Chhattisgarh this month. Clearly, Naxals have sent a signal. The attack also suggests that law-and-order situation remains poor in the State despite claims of crackdown on Maoists. In fact, it also shows poor intelligence gathering from the Maoist-infested region. Reports in Patrika and Hindustan Times, Delhi. Both carried it on front page but none used the word 'Terrorism'. A man wearing dark clothing and a dark baseball cap, first set off smoke bombs and then began firing indiscriminately in a bar in California. This resulted in death of 12 people. The incident occurred on November 8. This has happened just a fortnight after a white supremacist had targeted a synagogue. 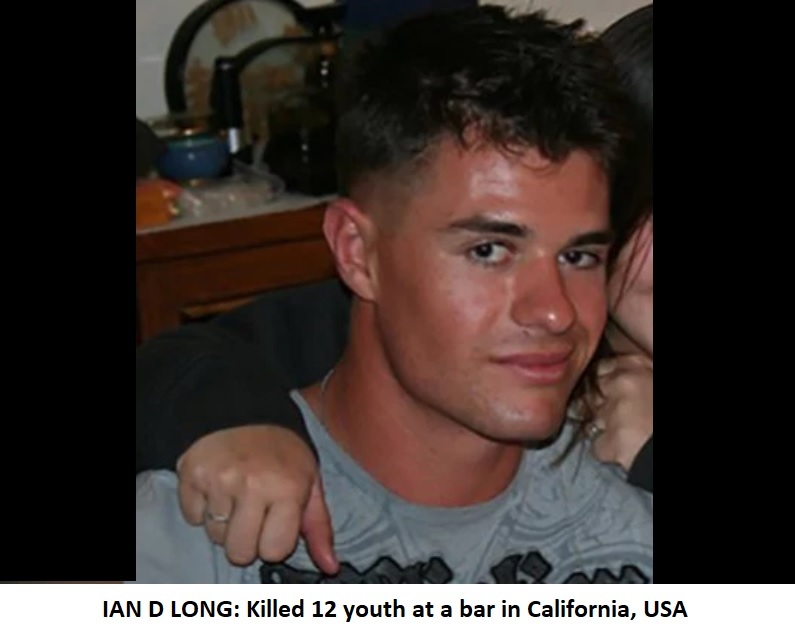 The terror suspect--Ian D Long, was an ex-marine. Long, 28, had joined Marine Corps soon after finishing his High School, over a decade ago. A trained machine gunner, he was assigned first battallion in Hawaii. Also, he spent time in Afghanistan. Ian D Long first shot dead the security man and later opened fire. A Sheriff's sergeant who responded to the shooting was also killed in the firing. The bar had around 100 people, mostly youngsters and college students. His body was also found at the spot. Initial reports suggested that he killed himself. Soon after the news was reported, there was panic. However, within 24 hrs the story was going down, as if it had become routine. The reports termed it as 'mass shooting' and NOT 'terror'. Once again, there were side stories about how an ex-marine could become a killer, dressed in black, with sympathetic views of his friends and acquaintances. An 80-year-old man was lynched by a mob in Sitamarhi in Bihar. The attackers were part of a religious procession, and they beat the elderly man to death. They later burnt his body in full public view. Worst, the administration not only failed to stop the rioters, it tried to suppress the news of this horrific murder. If this is not terrorism, what else is? How can members who were part of a religious procession turn into monsters? Terrorism is unlawful use of force or violence that is aimed to scare, terrorize and instill fear. So what happened in Sitamarhi on October 20. 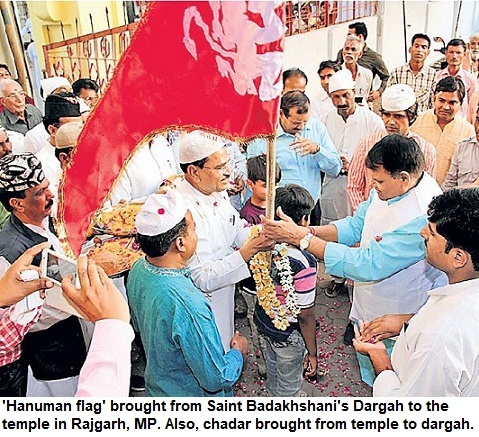 The right-wing extremists insisted on taking the Durga Puja procession to a Muslim locality.
" According to the local police officials, a prior warning had been issued to avoid any clashes. Upon being denied entry, the procession turned rowdy, leading to clashes....", reports The Quint. The elderly man, Zainul Ansari, was returning from his daughter's home. Those who were part of the procession, found a Muslim man alone and allegedly lynched him. Then, Muslim houses were attacked. 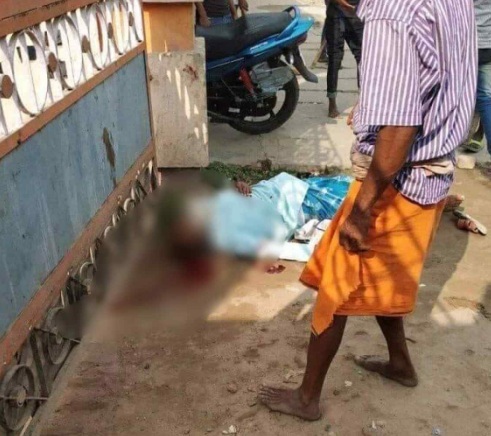 All this happened after those in a Durga Puja procession turned violent. Police officials' role is questionable as despite earlier warning the procession went and they could not prevent this mindless violence. Further, local administration apparently tried to hide its failure. The news was suppressed, internet was shut in the area. It took over ten days before the news came out of the State. It's almost unbelievable. Not only the level of hate, radicalization and communalism but also administration's carelessness and how media outside Bihar couldn't get information about it. Now the arrests have begun but shouldn't senior officials' responsibility be fixed. This report on the portal was the first to reveal the horrific nature of crime. Strangely, the photographs and video that were crucial evidence, were deemed 'inflammatory' and the portal was sent notice by police. Speaking up is even more important, as there is threat, fear and officials--after their failure, try to hide the truth. That, people in religious procession can resort to such crimes against humanity, is an example of growing madness. And, instead of action against officials, attempt is made to silence the media. This didn't happen in Port Blair but in the heart of North India. When the Quint mentions, ' The incident, however, went largely unreported ', it shows the sorry state of affairs. Who had stopped local media or Patna-based correspondents from reporting? Deeply disturbing on many counts. Bihar chief minister Nitish Kumar who claims to be a secular politican, must take action against police officials responsible for the incident. It's a test case for him. Sadly, RJD leader Tejashwi Yadav also remained silent. After the recent Supreme Court verdict in Pakistan in the case of Asia Bibi, hardliners in Pakistan were angry. There were retaliation calls and even Supreme Court judges were openly threatened. 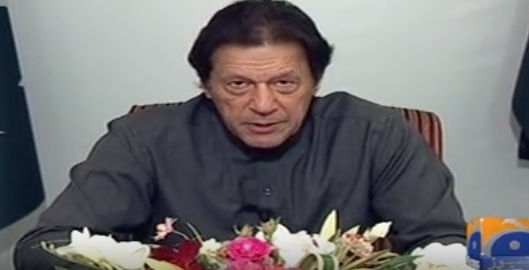 In such an atmosphere, PM Imran Khan addressed the nation. He clearly stated that country will run as per law and such anarchy--threats and lawlessness would not be tolerated. Anyone who saw the video must appreciate his candidness. This is a majoritarian disease that because the accused belongs to another religion, he or she must be 'wrong' while 'our own' are always innocent. Now compare this with the situation in India. 'If the name is Akhlaq, he must have kept beef in his fridge and so killing is justified---that's what many among the Hindu majority feel. It's the same with lynchings--imagine that victims were taking cows, hence, they needed to be punished. No need for courts, law or any due process. The person's innocence doesn't matter. In the Sabrimala temple issue, there are openly abusive comments on social media. Can PM Narendra Modi come on TV and say that on Ram Temple issue, 'Law will prevail, NOT aastha'? While, there is positive change in the neighbouring country, we are going in the reverse direction.